Plot Synopsis: To push the crime rate below one percent for the rest of the year, the New Founding Fathers of America (NFFA) test a sociological theory that vents aggression for one night in one isolated community on Staten Island. But when the violence of oppressors meets the rage of the marginalized, the contagion will explode from the trial-city borders and spread across the nation. Review: Although not well regards, I actually did enjoy the original Purge movie for its claustrophobic environment and some genuine thrills amidst some tepid writing. 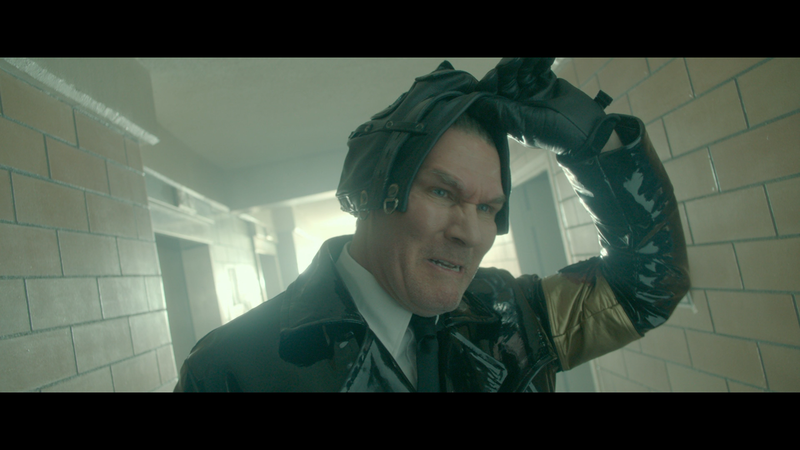 Anarchy and Election Day meanwhile were each slight declines for the franchise and it would seem The First Purge has taken us to basement level for the series. The movie doesn’t really do anything well. The horror is tamped down and any blood is produced by poor CGI and the thrills are at a minimum, and at no point was I scared or at the edge of my seat other than I was waiting for this boring entry to finally come to an end. On the positive side, despite the poor screenplay and some ineffective direction from Gerard McMurray (Burning Sands), the acting wasn’t half bad as I did really like Y’lan Noel who easily was the most charismatic of the ensemble, hopefully he gets more work down the line (John Stewart Green Lantern perhaps?). 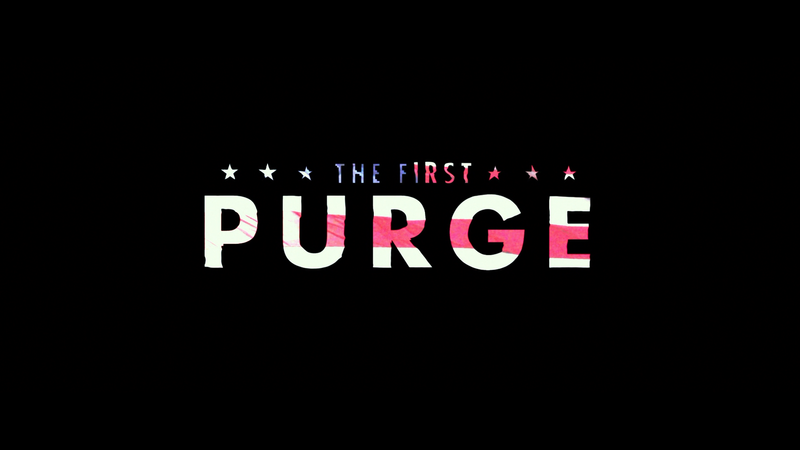 In any case, The First Purge was the weakest entry in a franchise that, like Saw before it, overextended its welcome on a thin premise, though it would appear this is the last feature film for a bit with the television series on air. This release comes with a glossy and title-embossed slip cover. Inside is the redemption code for the Digital HD copy. 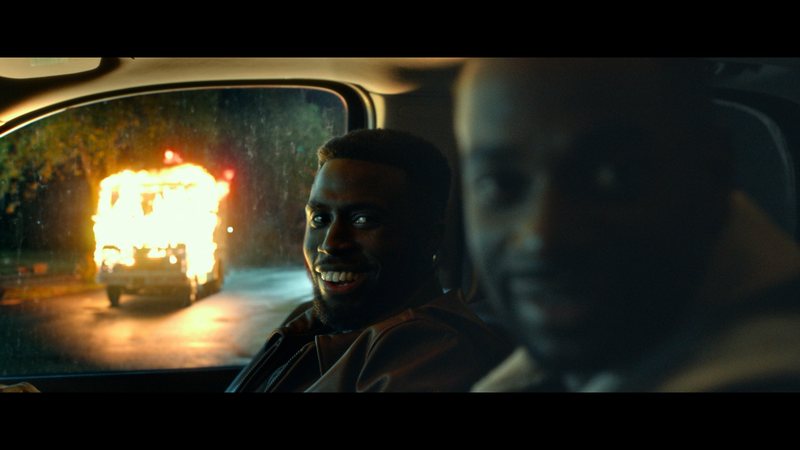 Features are on the lighter side with a singular Deleted Scene (1:47; HD) and three featurettes: A Radical Experiment (4:57; HD), Bringing the Chaos (1:24; HD1:22; HD) and The Masks of The First Purge () which delves into the making of the movie from the story, characters and designs. Nothing amazing nor immersive. 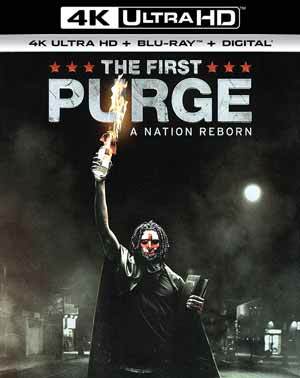 The First Purge puts on the 4K mask where it is presented with a 2160p high-definition transfer (1080p for Blu-ray) and shown in its original 2.39 widescreen aspect ratio. This is a rather brilliant looking picture from sharp detail, good skin tones and some bright colors including some neons (ranging from blues for the undercarriage of an SUV) to reds during one sequence, propelled on the UHD due to the HDR. 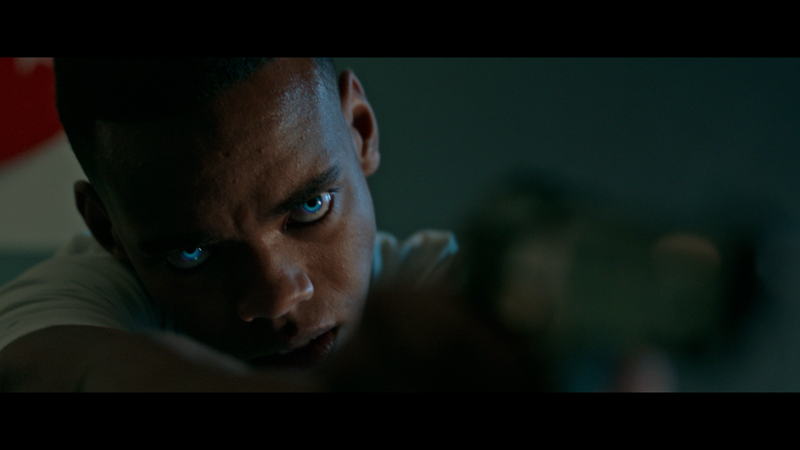 Both the UHD and Blu-ray discs come with a DTS:X track which, while never quite blew me away, was pretty aggressive at times and had great depth especially when the alarms would go off signally the beginning and ending of the Purge as well as crisp and clean dialogue levels, not to mention the impact of the various gunfire featured throughout the movie. Overall, The First Purge is by far the weakest of the four movies of the franchise and it’s not even close. Weak plot and thinly written characters torpedoed a series that was on a decline and for myself, I’m pretty much done. This 4K release from Universal offers up excellent video and audio (for both the UHD and BD) though the features weren’t anything noteworthy; better than nothing, however.